Executives, HR Directors, and Department Managers of employers with 30 or more FTEs will find value. Wednesday, July 8, 8:00 a.m.
Thursday, July 9, 10:00 a.m. to 7:00 p.m.
Tuesday, July 14, 7:45 a.m.
Tuesday, July 21, 8:30 to 10:30 a.m.
Have you checked out the Aurora Regional Chamber of Commerce blog lately? In addition to recent newsletters, you will find member news, public policy updates, community information, and much more. The 2015 Aurora Regional Chamber of Commerce Golf Classic presented by FirstMerit Bank was a huge success. Thank you to all our sponsors, volunteers, and to Orchard Valley Golf Course for all your hard work. Three-month Student Summer Pass available at Fox Valley Park District. To qualify, a student ID should be presented. VNA Health Care and City of Aurora are partnering on Fresh First, a program introduced last year at the Aurora Farmers Market to promote healthy eating. Fresh First is a fun way for children to learn about the health benefits of eating fresh produce. Congratulations to AM Staffing Group, Inc. on a successful ribbon cutting on Thursday, June 18. Save the Date: Golf for a Cause! Thursday, July 9, at 9:00 a.m. registration. Golf outing proceeds will assist the Association for Individual Development (AID) in funding programs and services that empower people with physical, developmental, intellectual and mental health challenges to enjoy lives of dignity and purpose. Registration forms due by June 15. Sikich LLP was recognized as number seven on the 2015 Best Places to work in Illinois, Large Company (500+ employees) by Daily Herald Business Ledger. The third annual Naperville Ale Fest will feature over 180 unique beers from craft breweries around the country from 1 to 5 p.m. Saturday, July 18. A portion of the proceeds will be donated to Naper Settlement and the Naperville Heritage Society. For more information, contact info@naperillealefest.com. A big thanks to Zippy Shell Fox Valley for sponsoring the Fox Valley Networking Professionals on Thursday, June 25. The Growing Place in Aurora is offering Gardening 101: Hydrangeas, on Saturday, July 11 at 10:00 a.m. This class is free and will include learning about different types, where they are best suited and how to care for them. During Settlement Sundays, admission to Naper Settlement includes free sundaes from Culver’s with do-it-yourself toppings, hands-on family activities and tours of historic buildings. July 5, 19 and 26 from 1:00 to 4:00 p.m. Ice cream is served from 2:00 to 3:30 p.m. Naperville residents are free. Visit napervillesettlement.org for more information. Communities In Schools of Aurora, a non-profit organization, achieved Total Quality System (TQS) national accreditation. The TQS model documents graduation rate outcomes and through this accreditation, Communities in Schools of Aurora has clearly demonstrated both decrease dropout rate and increased graduation rate. The Communities In Schools of Aurora Back to School Fair volunteer coordinator is looking for volunteers for Tuesday, August 11 through Saturday August 15. Please call Joanna at (630) 256-4505. Thursday, June 25, at 4:00 p.m.
Thursday, June 25, at 8:00 am. Illinois lawmakers are returning to Springfield amid a stalemate over a new state budget. But neither chamber is expected to take up proposals Gov. Bruce Rauner says he wants passed before he’ll sign a 2016 spending plan. The Illinois Senate is scheduled to discuss college affordability Tuesday. The House is set to consider the Republican governor’s proposal to privatize the state’s economic development agency. Rauner and Democrats who control the Legislature have been battling over the budget for the fiscal year that starts July 1. Democrats approved a plan that’s more than $3 billion short of anticipated revenue. They want Rauner to OK a tax increase to avoid severe cuts to areas such as higher education. Rauner first wants lawmakers to pass pro-business measures such as a property tax freeze. Each day is jam-packed with outside adventures that will end with an overnight campout at a local park. This year’s activities may include hiking, creek exploring, canoeing, swimming, team games, museum visits and more! M-W: 9 a.m. to 4:30 p.m.
Do you have the skills to find Bigfoot? Campers will practice tracking, sample collecting, trapping and more before ending the week with an evening investigation for truth! 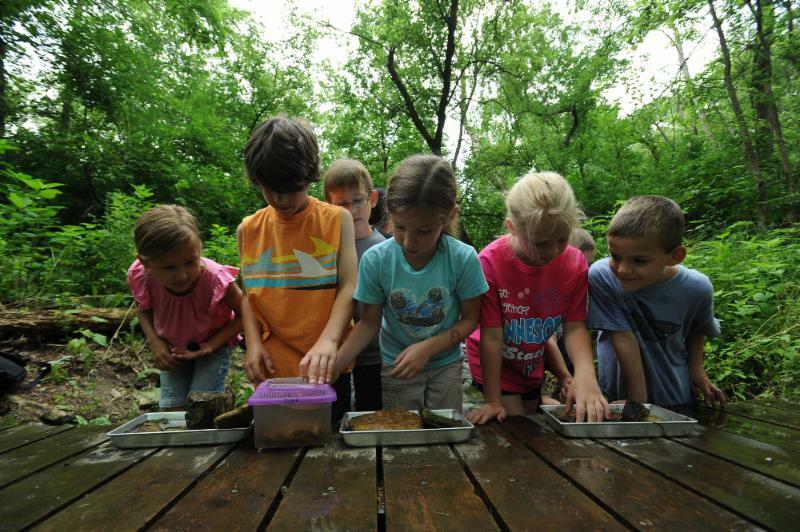 M-Th: 9 a.m. to 3:30 p.m.
F: 3:30 to 8:30 p.m.
Other camps include: Masters of Wild Survival, Spineless Wonders, Wild Survival, Wet n’ Wild Investigations, Wetland Wonders, Nature’s Neighbors, Wild Artists, Buggin’ Out, Wild Nights at Red Oak and Itty Bitty Bugs. View all of Red Oak Summer Camps here! Munger pointed out that some monies remain in place to pay essential bills under the “lapse period” law. This law allows leftover money appropriated for use in fiscal year 2015 (FY15) to be spent down during the first 60 days of FY16. However, funds available under this pathway fall far short of the monies required to keep all of the State’s legal commitments, such as paychecks for State workers and GSA payments to schools. House Republicans have repeatedly called for the startup of real budget negotiations and the creation of a balanced budget, as demanded by the state Constitution. Gov. Rauner and reformers call for stricter causation standards. One of the open issues facing the Illinois General Assembly is the need for real workers’ compensation reform. HB 4223, legislation sponsored by House Republican Leader Jim Durkin with the full support of Governor Rauner, contains changes in causation standards that could help eliminate Illinois’ status as one of the top 10 U.S. states with the highest workers’ compensation insurance costs in the country. Most employers are required to purchase workers’ comp insurance for their employees as a legal mandate on the employer-employee relationship. The insurance premiums are not only tied to the actuarial danger of each workplace, but to each state’s underlying laws that impose burdens on the workers’ comp system. States characterized as more burdensome, such as Illinois, see higher workers’ comp insurance rates. As workers’ comp premiums are a mandated add-on to the cost of each employee headcount position, any increase in the cost of workers’ comp insurance will reduce the number of Illinois jobs created and maintained. Illinois’ unemployment rate is 6.0 percent as of April 2015, higher than the national unemployment rate of 5.4 percent. Illinois job creators are placing increasing pressure on the General Assembly to enact real workers’ compensation reform. As of Friday, June 12, however, the workers’ comp reform bill (HB 4223) remained bottled up in the Madigan-controlled House Rules Committee. Property tax relief and mandate reforms needed to help middle-class families. Both the Illinois House and the Illinois Senate discussed and debated property tax issues during their sessions on Tuesday, June 9. No resolution was reached in either house. A report from the nationwide Urban Institute labeled Illinois as the state with the second-highest property taxes in the U.S. Heads of local governments and tax reform experts agree that a freeze on Illinois property tax bills, or on the local-government property tax extensions that are used to generate these bills, could have unintended consequences. Many advocates are starting to call for real reforms in the way Illinois taxing bodies fulfill their duties. Relief that could be offered includes reductions in the unfunded mandates imposed by Springfield on local governments and school districts. Governor Rauner has renewed his call for the General Assembly to take a genuine look at these mandates and to sit down with him in real negotiations on one of the issues that faces the State and its taxpayers. House Republican Leader Jim Durkin has filed HB 4224 to enact a property tax freeze and reduction in local government mandates. Illinois program to underwrite prepaid tuition contracts at Illinois colleges and universities faces long-term challenges. The College Illinois program, operated by the Illinois Student Assistance Commission (ISAC), asks contractual depositor/investors to provide money up front for a future college student named by the investor. Funds deposited in College Illinois are used to prepay tuition at an Illinois public college or university for that student. College Illinois is an approved, tax-advantaged investment vehicle under Section 529 of the federal Internal Revenue Code. Section 529 prepaid tuition programs, like College Illinois, should be distinguished from Section 529 college savings plans such as Illinois’ Bright Start program, operated by the Illinois Treasurer’s office. Popular in the 2000s, state prepaid-tuition programs like College Illinois have come under fiscal challenge in the 2010s due to changes in public perception of governmental probity and falling rates of return on invested capital, even as tuition rates continue to increase. ISAC reported on Tuesday, June 9 that over a two-year period, they have sold too few prepaid tuition contracts to enable persons connected with the program to feel assurance that it can continue to operate indefinitely. During this two-year period 1,084 contracts were sold (438 in 2013-14 and 646 in 2014-15), well short of the 3,000 contract sales required for the program to enjoy sustainability. Monies invested in College Illinois by existing contract holders are being invested and managed on a professional basis, and the program has partly recovered some of the unfunded deficits that appeared in the depths of the 2008-13 economic downturn. Sharp returns on monies invested in Wall Street equities have enabled College Illinois to keep its immediate commitments and partly claw back its standing. ISAC has told House Republicans that families with College Illinois contracts that are close to maturity are highly likely to enjoy a full return on their assets invested. Continued investigation leads to administrative leave for key officials. Auditors continue to look through the books of the College of DuPage (COD) and the administrative decisions taken by departed President Robert Breuder and other top college officials. On Tuesday, June 9, two key college vice presidents of financial affairs were placed on administrative leave by interim college President Joseph Collins. Affected by the move were Thomas J. Glaser, COD’s senior vice president of administration and treasurer, and Lynn Sapta, assistant vice president of financial affairs and controller. The administrative action was accompanied by a disclosure that the College has lost $2.2 million that had been deposited in a risky investment fund. The “Clean Slate” panel of new COD college trustees, most of whom were elected in the spring 2015 election, questioned Glaser and Sapta at the May 2015 board meeting. The trustee majority members have placed themselves on record as being in complete support of the ongoing coordination of audits and investigations that are scrutinizing the recent fiscal and administrative records of the public college. Efforts continue to address the auditors’ recommendations prior to the start of the College of DuPage’s fall term on August 19. Continued prompt action became even more essential with the May 2015 announcement by the Higher Learning Commission, the COD’s accreditation commission, that COD’s standing as an accredited institution of higher education has been placed under review. General Assembly approves bill to authorize expansion by craft breweries. A bright spot in the Illinois economy is the rising number of craft operations that brew unique and local beers, which are often sold on-site in brewpubs or taprooms. Many beer distributors are developing mutual arrangements with craft breweries; these contracts expand the opportunity for these beers to be consumed in local taverns and even sold in beverage stores and groceries. While current law allows many breweries licensed as craft breweries to brew up to 30,000 barrels of annual production, this cap increasingly limits production growth and job creation by Illinois brewmasters and owners. On Tuesday, June 9, the Illinois House concurred with Senate amendments to HB 3237 to increase the craft-brewing production cap to 120,000 barrels/year, sending the measure to Gov. Rauner for possible approval. Fate of Abraham Lincoln Presidential Library left without resolution. One of the bills passed by partisan majorities of both houses of the Illinois General Assembly, and then stalled on the order of “Motion to Reconsider,” was SB 1728. This controversial measure would move the presidential library from the Illinois Historic Preservation Authority and make it an independent State agency. The House vote on SB 1728 as amended by the library language was 69-47-0. However, after the Senate concurred with the House’s Lincoln Library language on May 31, 2015, Senate President John Cullerton filed a “Motion to Reconsider” on the bill. This parliamentary move effectively locked the bill in his desk drawer and left the Library and its approximately 95 headcount employees without closure as of mid-June 2015. Illinois State University hosts athletic festival. The Illinois Special Olympics are scheduled to kick off on Friday, June 12, at ISU’s Bloomington-Normal campus in central Illinois. The games are scheduled to continue until Sunday, June 14. Qualified athletes from all over Illinois were invited to compete in aquatics, bocce, gymnastics, powerlifting, soccer, and track and field events. More than 4,100 athletes are scheduled to attend with friends and family. Athletes qualify for the Illinois Special Olympics through their participation in affiliated events. Track and field athletes qualify through gold-medal-level participation in Special Olympics Area Spring Games, while a variety of sanctioned competitions are used to qualify competitors and teams in aquatics, bocce, gymnastics, powerlifting, and soccer. The games are overseen by Special Olympics Illinois. Deputy Republican Leader Patti Bellock honored Special Children’s Charities and the Special Olympics movement in HR 503, adopted by the House in mid-May. Wireless Phones and the National Do-Not-Call List. Placing telemarketing calls to wireless phones is – and always has been – illegal in most cases. Why the confusion about telemarketing to wireless phones? The Illinois General Assembly failed to produce a balanced state budget during its regular session, an act required by the state constitution. But that doesn’t mean legislators wasted their days. They passed some important stuff, ranging from pushing for the restoration of Pluto’s status as a planet to making sure the state has an official vegetable, pie and even polka song. A House resolution calling for the restoration of Pluto as a full-fledged planet: Gov. Bruce Rauner probably wants to send some legislators to Pluto, but this has been an issue floating around the statehouse for a few years. That’s because Clyde Tombaugh, the man who discovered Pluto, was born in Streator. Pluto was demoted from planet to minor planet in 2006 by the International Astronomical Union. Past legislatures have also considered resolutions to make Pluto a planet again, which have been mostly ignored by the astronomical union. A House resolution naming the state’s official polka song: Because, every state needs an official polka song. The song, “Polka Celebration,” was written and composed by Chicago native Eddie Blazonczyk Sr., who won a Grammy for the tune in 1986. Bills to designate the pumpkin pie as the official state pie and sweet corn as the official state vegetable: We have nothing against pumpkin pie or sweet corn. Both are grown in great quantities in the state. A House resolution requiring rest areas to stock their machines with at least two healthy snacks: Here’s where the legislature could use its imagination. Why not require every rest area to sell pumpkin pie and sweet corn? Now we’re on to something. A bill that would create a monarch butterfly license plate to raise money to plant more milkweed, which will help boost the population of the state’s official butterfly: The monarch was declared the state’s official butterfly 30 years ago after a lobbying effort by students at Decatur’s Dennis School. But the state has too many license plates. The monarch does need more milkweed habitat, but we don’t see how a license plate accomplishes that. Milkweed seeds might do the trick. A bill that would allow meat processors to butcher exotic game meet gunned down at places like Ted Nugent’s ranch in Michigan: We didn’t even know that was an issue, but it’s good to know that the legislature is on top of it. We hope someday soon to write an editorial praising a compromise that has put the state on a sound financial track. Until then, it’s nice to know that the General Assembly is trying to sort out some of these pressing issues. SPRINGFIELD — The Illinois Senate is scheduled to hold a hearing on college affordability Tuesday as part of their summer overtime session. With two weeks to go before the state enters a new fiscal year without a budget in place, the Senate hearing is expected to mirror one held last week on property taxes, in which witnesses testified before the entire Senate on the positive and negative effects of freezing property taxes. The hearing is designed to highlight another difference between Republican Gov. Bruce Rauner and Democrats who control both chambers of the General Assembly. Democrat legislators are battling Rauner over his push to enact business-friendly reforms in exchange for a tax increase that would help close a $3 billion budget gap. For the rest of the article, visit the Decatur Herald-Review.com. It’s overtime at the Illinois Statehouse. A battle over the state budget has forced a stalemate and extended legislative session at the Capitol. The opposing fronts of the debate are the Republican governor, who is pushing for spending reforms, and Democratic legislators, who have an end game of raising taxes. Democratic lawmakers in Illinois have used nearly every form of political theater to push for a tax hike to fix the state’s budget crisis. But no amount of political showmanship can change the stark fact that balancing the state’s budget by reforming spending – and without tax hikes – is the only sustainable and responsible option for Illinois’ economy. Democrats have controlled Illinois’ executive branch and legislature for more than a decade, using higher taxes as a first resort to pay for Illinois’ mounting pension debt and bill backlog. The state’s new Republican governor, however, has brought a very different political mindset to the budget discussion. Gov. Bruce Rauner has demanded a balanced budget that does not raise taxes, along with solutions such as workers’ compensation reform, a property-tax freeze, term limits and redrawing legislative districts. Democrats have resisted the governor’s proposed reforms and instead have pushed for higher taxes and a budget that would spend nearly $4 billion more than the state’s expected revenue. For the full article, visit IllinoisWatchdog.org. VNA Health Care and City of Aurora are partnering again on Fresh First, a program introduced last year at the Aurora Farmers Market to promote healthy eating. Fresh First is a fun way for children to learn about the health benefits of eating fresh produce. It gives both children and adults the opportunity to try new vegetables and fruits, and to pledge to try their best to eat healthy during the program. Everyone is welcome to visit the FreshFirst booth at Aurora’s Farmers Market on Saturdays. Anyone who takes advantage of the free samples of the fruit or vegetable of the week and fruit-infused water will receive an “I Got FRESH Today!” sticker to show their commitment to healthier eating habits. Visitors can also pick up free recipes using the fresh produce available at the Market. “We are excited about this partnership with City of Aurora and hope to inspire everyone who visits our booth at Aurora’s Farmers Market to try new fruits and vegetables and look for ways to incorporate these healthy choices into their everyday diet,” said Ann Cheverton, Vice President of Care Coordination and Clinical Innovation at VNA Health Care. Through a United States Department of Agriculture (USDA) Food Insecurity and Nutrition Incentives grant and a Fit for Kids grant through the Kane County Health Department, VNA is able to offer a free FreshFirst program to patients. Targeted patients include children, pregnant women, and breastfeeding mothers. Participants in the grant-funded program receive a weekly prescription for fruits and vegetables worth $10 to redeem at any of Aurora’s Farmers Markets, including a small “Pop-Up” market held at VNA, 400 N. Highland Avenue in Aurora on Wednesdays, July 8 through September 30 from 9:00 to 11:00 a.m. The patients also receive free group education and cooking demonstrations offered in VNA’s Healthy Lifestyle Center and Kitchen at 400 N. Highland Avenue in Aurora. Through education, a meal log, monitoring and family support, participants are encouraged to change their eating habits and learn to enjoy fresh fruits and vegetables as part of their diet. VNA tracks their patient’s weights and measurements throughout their participation in the program. The Fresh First program benefits the Aurora community by nourishing the consumer, boosting farmers’ revenue and supporting the overall health of our community. In 2014, the program was named “A Friend of the Industry” by the Illinois Office of the Comptroller for its dedication to the field of Agri-Tourism. Through partnerships such as Fresh First, VNA Health Care demonstrates our commitment to providing health services to meet the unique needs in the communities we serve. You are currently browsing the Aurora Regional Chamber of Commerce blog archives for June, 2015.